While trading much on the expected lines, the Indian Markets consolidated for the major part of the day on Tuesday. 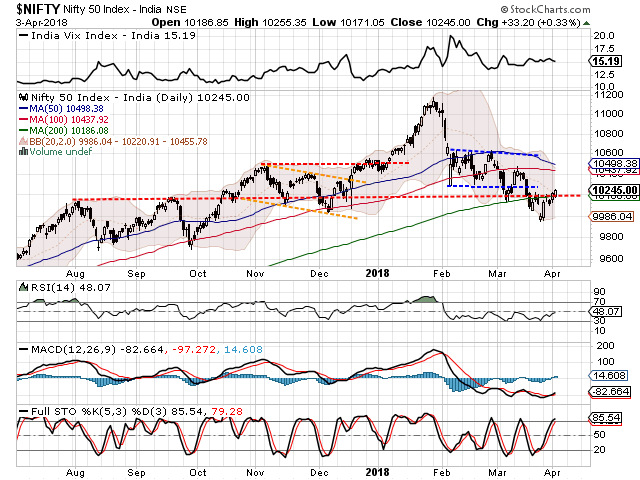 What remained technically significant was that the NIFTY behaved much in the resilient manner to the global weakness. Even more important was that while it consolidated on Tuesday, it took support once again at its 200-DMA and rebounded from there. It finally ended the day gaining 33.20 points or 0.33%. As we approach Wednesday, we need to watch the Markets on similar lines. Runaway up move may not occur but overall, the Markets may see the follow through up move. However, before such follow through up move happen, we may once again see a range bound consolidation wherein NIFTY is once again expected to continue to defend the 200-DMA which stands at 10186. The levels of 10275 and 10330 will play out as immediate resistance area for the Markets. Supports are expected to come in at 10185 and 10120 zones. The Relative Strength Index – RSI on the Daily Chart is 48.0716 and it continues to remain neutral against the price showing no divergence. The Daily MACD stays bullish while trading above its signal line. 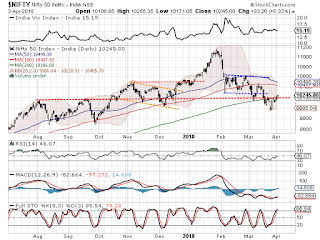 The pattern analysis shows that the NIFTY has managed to slowly crawl back above the 10180 which was also one of the important pattern resistance areas before. With the 200-DMA inching litter higher, in event of any consolidation happening, the levels of 10180 are expected to act as support. Overall, we do not expect a runaway rise happening given the overbought nature of the some of the oscillators and also relatively higher NIFTY PCR (Put to Call Ratio). However, under no circumstances this point towards any kind of impending weakness. We expect the Markets to consolidate and keep making efforts to inch higher. Any consolidation, if any, will lend health to the Markets to move higher. We reiterate our advice to keep making select purchases during the periods of minor consolidation and maintain a stable outlook on the Markets. Fresh long positions were seen being added on counters like BANK OF BARODA, SOUTH BANK, NHPC, TATA MOTORS, DLF, HDIL, VEDANTA, FEDERAL BANK, ASHOK LEYLAND, NCC and SAIL.